For many years, The Henry Box School and Wood Green School have been collaborating in areas where the two schools can be mutually supportive of each other’s curricular provision. If you would like to study a subject at Henry Box but cannot, due to a clash with another of your choices, you may be able to study this at Wood Green, and vice versa. Some subjects are also co-taught by teachers from both schools, giving you a really diverse educational experience. This long standing partnership enables both schools to provide the young people of Witney with a truly comprehensive curriculum. In September 2017, secondary schools in West Oxfordshire and Abingdon & Witney College collaborated for the first time to give students the opportunity to study a blended offer made up of a mix of A levels and a Level 3 vocational qualifications. Students are able to choose from a range of A levels and a range of Level 3 vocational qualifications (BTEC). For full details of these courses please see the course information booklet. Why A level and BTEC Together? 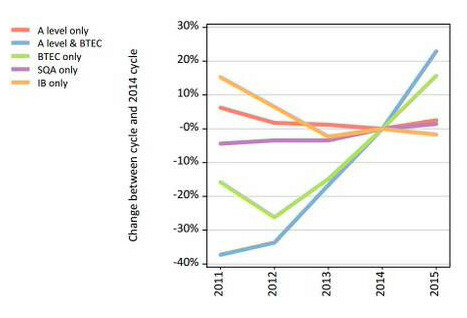 A combination of A levels and Level 3 BTECs is the fastest growing learning pathway at present. In 2016 26% of university undergraduates accessed university with at least one Level 3 BTEC. This combination is also suitable for students wishing to access higher level apprenticeships and university degrees whilst being able to keep their options open (see the graph below). The Government has changed A levels to become linear qualifications meaning that students will only take exams at the end of two years. Universities are no longer using AS grades when deciding upon offering places and will instead look at the best 3 A level grades achieved. Our KS5 curriculum has moved to a linear model meaning that students will not sit AS exams at the end of Year 12. The Extended Project Qualification (EPQ) will also be offered to students who wish to study it. The EPQ is a project-based qualification that attracts UCAS points and is well received by universities and employers as it demonstrates high levels of independent learning. Details of this will be delivered to students in September 2018. We recommend most of our students to enrol on 3 A levels when they join us. We can now offer greater flexibility regarding a mix of A levels plus Level 3 BTECs and/or EPQ. A very small number of students may elect to take a 4 A level option. Each student will be invited for a supportive interview to discuss the type and number of subjects with the KS5 team. This pathway is designed for students who achieve a minimum of 5 subjects at grade 5 including/as well as grade 4 or above in English and Maths. Students study A levels and EPQ only and choose 3 subjects from boxes A-E. The entrance criteria for this pathway are dependent upon which A levels students choose as each subject has varying entrance requirements (please refer to the subject information). This pathway is open to students who would prefer to study a more vocational course alongside A levels. Students can choose from a combination of A levels and BTEC Level 3 qualifications offered both at The Henry Box School and Abingdon & Witney College. To access this pathway students require a minimum of 4 subjects at grade 4 including/as well as grade 4 or above in English and Maths. Students will need to have achieved the individual entrance criteria to access their chosen subjects (please see course information). The Sixth Form team will be in school on GCSE results day and the following morning. If you have any questions or you have fallen slightly below the entrance criteria please come in to speak to a member of our team who will be here to support you. We recognise that 2018 is a year with lots of change so we are going to be as flexible as possible. If we feel that we have a pathway that is suitable for a student who falls short of the entrance criteria we will do our best to accommodate them. The specific needs of each student will be dealt with on an individual basis and our decision will be purely based upon what is best for each learner. For some students who access sixth form it might be necessary to re-sit English and Maths. The Department for Education has stated that a pass grade for students sitting English and Maths in 2018 is set at a grade 4. However, they have termed grade 5 as a ‘good pass’. We would recommend that any student who has not achieved a grade 5 in either Maths or English consider re-taking in order to obtain this grade as it may become an important threshold to have achieved in the future. Students who do not achieve our minimum entrance criteria of grade 4 for both English and Maths will receive a separate programme to help them successfully retake and pass in Year 12. The admission arrangements for the School can be found on this website via this link.